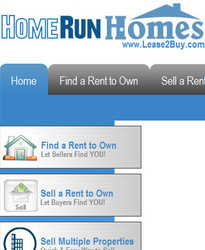 Ronkonkoma, New York, November 15, 2010 - HomeRun Homes (www.Lease2Buy.com), the long-standing marketplace for Rent to Own Homes, is now a confirmed member of the prestigious Building Trades Association. (1888PressRelease) November 15, 2010 - Ronkonkoma, New York, November 15, 2010 - HomeRun Homes (www.Lease2Buy.com), the long-standing marketplace for Rent to Own Homes, is now a confirmed member of the prestigious Building Trades Association. 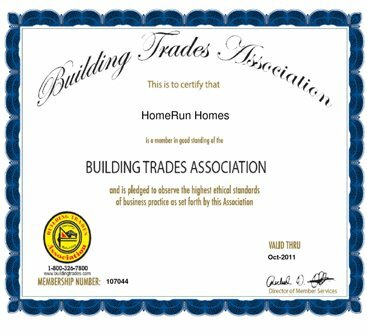 The Building Trades Association, or BTA, which consists of member companies involved in all phases of the building and construction industries, has offered membership to HomeRun Homes. Robert Eisenstein, the CEO & Founder of HomeRun Homes, states that, "We were a little concerned over the fact that our company is slightly different than the standard membership at BTA". Eisenstein continues to say that they submitted their application and were waiting, "for positive news since our request had to go through a different chain of command for review". As of today, HomeRun Homes is now an official member of BTA, and Eisenstein feels that due to the large amount of Builders that list their homes on his website, this makes good business sense for both BTA and for HomeRun Homes. Eisenstein was quoted today as saying, "We were recently invited to join some additional highly-respected trade associations, and we are currently examining their credentials along with their application process." Some additional senior members of the management team at HomeRun Homes were quoted as saying that, "Our longevity in the Real Estate Industry, coupled with the service we provide to the Building/Construction segment, makes us a valuable resource for Builders that are sitting on newly-built homes." HomeRun Homes is in the midst of one of their busiest years since their website went live in 2002. Earlier this year, they celebrated their 8th anniversary, launched a new website for foreclosure assistance via Rent to Own, achieved the vital PCI DSS Web Security Compliance, and they have received a large amount of publicity in print and electronic media along the way.